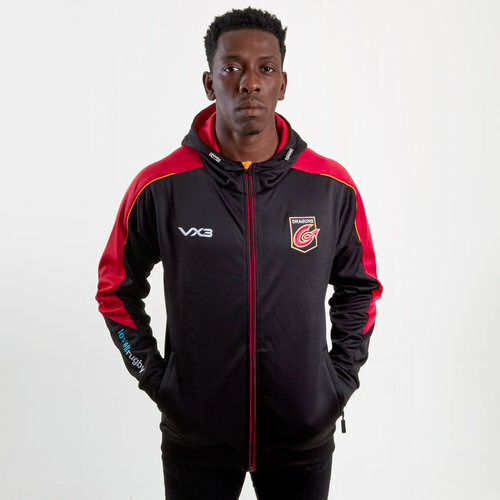 Ready to pull on to stay warm in the stands at the Rodney Parade or at training, make sure you show everyone who you're supporting with this VX3 Dragons Pro Full Zip Hooded Sweat. 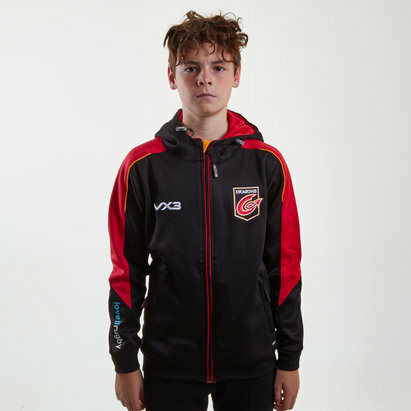 Made from a soft polyester with a fleece lining, this Dragons hoodie makes for great casual wear all year round. Whether at the match or simply around the home, you can be assured of a great feel and look that you will be proud to pull on any time. Designed with the Dragons and VX3 logos proudly embroidered on the chest, training wear sponsors Lovell Rugby take place embroidered on the right sleeve of the hoodie. In smart black and red colours with gold trim, a full zip and drawstrings on the hood allow you to wear this hoodie how you like. Proudly pull on this VX3 Dragons Pro Full Zip Hooded Sweat anywhere.